Children's ministry peeps are the best! I'm so thankful God has allowed me to be part of the children's ministry world, aren't you? There's no other place I'd rather be. 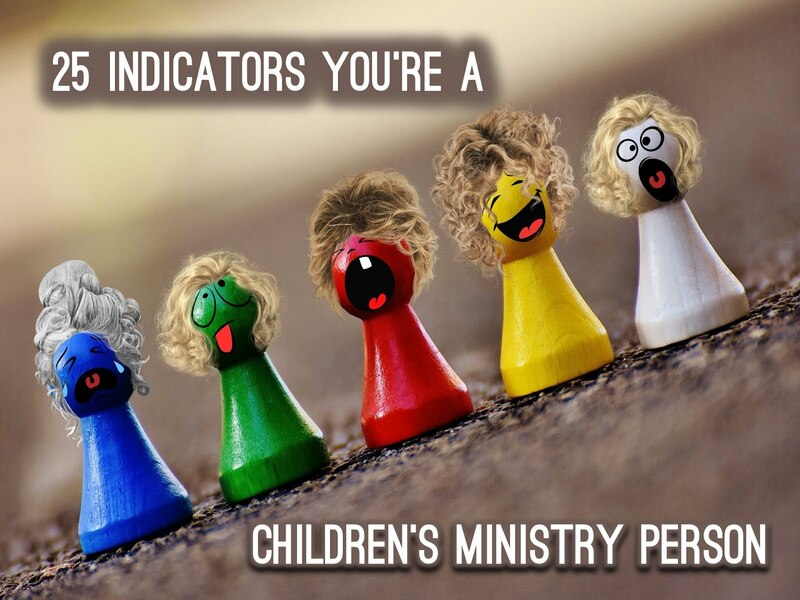 There are some unique indicators that reveal you're a children's ministry person. Here's 25 of the fun ones. I hope these bring a smile to your face and encouragement to your heart today. 1. You feel pulled toward the toy department when you're in Target. 2. You know how to pray for healing for dogs, cats and goldfish. 3. You know the proper pronunciation for baptize is babbapatized. 4. You're an expert at telling knock-knock jokes. 5. You believe Larry and Bob should be nominated for an Oscar. 6. You laugh when the other ministries in the church say summer is a slow season. 7. You're in great shape from doing worship song motions every weekened. 8. Offering comes in coins not bills. 9. You've never taught about the Beast of Revelation, but you have taught about David and Goliath 12 times. 10. You've ordered something from Oriental Trading in the last 3 months. 11. You know the name of at least 3 puppets. 12. You wear your Sunday best to church - a t-shirt with a children's ministry logo on it. 13. There's a good chance when you visit the hospital it involves someone having their tonsils removed. 14. The church janitor has been mad at you on several occasions. 15. Your preferred seat on Sunday morning is a rocking chair in the nursery. 16. A cashier at Wal-Mart has asked you why you're buying 25 bags of marshmallows. 17. You believe the manna in the Old Testament was goldfish crackers. 18. You get restless in an adult service because you have to sit still and be quiet. 19. You've seen vomit in every color imaginable. 20. Pagers aren't out-of-style for you - you use them every week in the nursery. 21. You know the go-to answer for any review question you don't know is "Jesus." 22. You order the kid's meal at McDonalds...for yourself. 23. You know that a name tag stuck on a chair is hard to remove. 24. You know the choir is where AWOL preschool workers now serve. 25. You have flashbacks of preparing thousands of Easter eggs for a hunt. All kidding aside...thank you for your heart for kids and families. I believe children's ministry is the greatest ministry in the church and children's ministry people are the best leaders in the church. Your turn. Add to the fun by adding some other indicators in the comment section below.